I almost didn't make it today for my 14 Days of Valentine's. 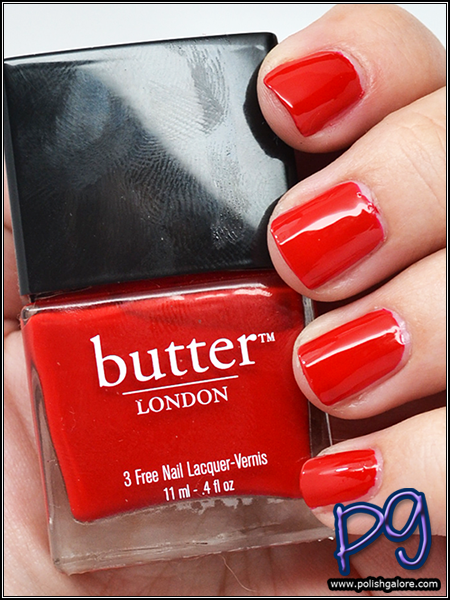 It's been another rough week so what better way to celebrate than with some butter LONDON? Today I have Pillar Box Red, a red-orange creme. I don't own a lot of butter LONDON polishes but I do love how they line up so pretty in their bottles. The black cap is a false cap that can be pulled off to reveal a smaller round handle. I used a base coat of Duri Rejuvacote, 2 thin coats of polish and finished with Glisten & Glow H K Girl top coat. The formula was really nice - a little thin with the first coat and then totally opaque with the second coat. I got a little on my sidewalls but was able to easily clean up with red staining. I still haven't gotten in to get my nails handled but I tried to file them bit and used my Weleda Cuticle Softening Pen. I'm hoping next week will be a little smoother so I can get a manicure in. This is a great red for not just manicures but I'm actually pretty interested in using it for a pedicure too! butter London [Website] [Facebook] [Instagram] [Twitter] [YouTube] is available for $15 a bottle.